If you are just starting out on your photography journey, or you have recently stumbled across your passion for capturing amazing photographs of whatever it is you enjoy shooting, you want to learn the best practices, tips and tricks to be the best photographer you can be. Whether you want to start your own business or just take your photos as a hobby, here are 4 photography tips for beginners that we hope help you out! You need to have a camera that works for the type of photography you do and that does not always mean you need the latest, most expensive camera on the market. Research all the cameras out there and choose one that fits your specific needs. If you are starting your own business, you may want to spend a little more than you would if you are simply wanting to take photos as a hobby. But, like we always say, it is not the size of the lens, it is how you use it. It is important for your photography to really grow by figuring out what specialty you want to focus on. Of course you can always photograph other things, but having that focus is key to improving and learning the best ways to capture the subject you are focusing on. Do you really love the passion between a bride and groom on their wedding day? Focus on wedding photography. If you really prefer and love the work you do with still objects outdoors, focus on landscape photography. Your specialty is totally up to you and all depends on what your passion is. But with that said, as a photographer, the possibilities are truly endless and you can capture photos of anything that makes you happy. Whether you have been taking photos for the past year, or you literally just purchased your first camera, always continue to learn. Read blogs or photography books, take classes, talk with other photographers and learn what they do and why they do it. Whether you want to learn about your camera itself, techniques you can use to photograph the subject or objects you enjoy, or even learn more about different programs you can use for editing your work, the industry is always changing which means continuing to learn is an essential part. Take lots and lots of photos! Keep practicing and perfecting your craft. Just like with anything else, the more photos you take, the better you will become. Get out and explore new angles or try out a different lens or even scope out new locations that you have never been to and see what it looks like in photos. If you do photography as a hobby, carry your camera with you even if you are not planning on photographing something. You never know what you can find when you are not looking! If learning is something that you want to be sure to do this year, we have tons of great guides you can easily buy and download about so many aspects of photography. Are you a new photographer that is not sure if you want to actually start a business or not? Wondering what all it takes to start your own photography business? How To Start Your Photography Business would be the perfect guide for you. For $149.99, read this 133 page guide that will tell you everything you need to know about how to get your business started, marketing, getting a web presence, and business planning. CLICK HERE TO PURCHASE THIS BUSINESS GUIDE NOW! When you are just starting out in the photography industry, whether you just have an interest in learning more about the passion you have, or you have started a business and are learning along the way, there are so many different things to learn. Between shutter speeds, ISO, shooting modes you can use, and even the different types of camera available, it can all get confusing when you are beginning. We found this great infographic on Petapixel that we had to share: The Complete Guide To Photography For Beginners. We hope this helps you out and provides a guidance for you to help get going on your photography journey. Enjoy! Are you just starting off and need some extra help with the lighting aspect of your photography? Look no further! The Beginners Guide to Lighting is a MUST HAVE! 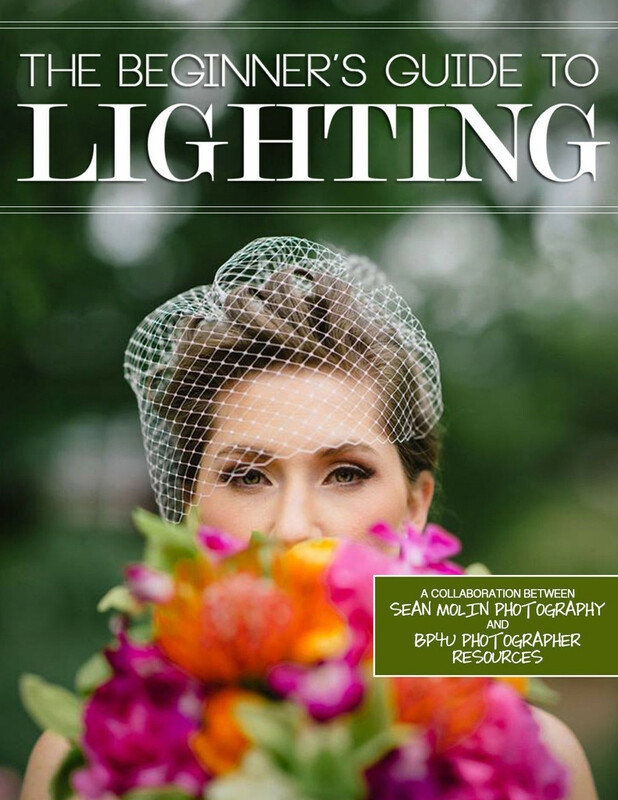 For only $29.99 (regularly $299.99), Sean Molin breaks down everything you need to know about lighting. Learn about different natural lighting conditions as well as ISO, aperture and shutter speed, white balance, lens flares, using shadows correctly and so much more! CLICK HERE TO PURCHASE THE BEGINNERS GUIDE TO LIGHTING! If not, be sure to enter here for a chance to win a Canon 5D Mark III or Nikon D800! Also, enter your info below to to stay up to date on our other giveaways and industry deals and news!